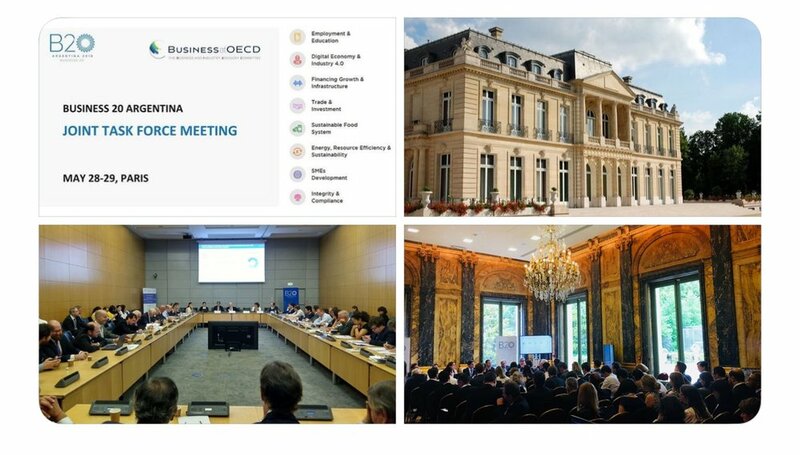 I was delighted to be invited to join the 2018 OECD Week in Paris, for a series of high level meetings and discussion. The G20's Business Dialogue held a Joint Task Force Meeting, which I joined as a member of the Integrity & Compliance Taskforce. Since this round of Task Force meetings was being held at the OECD, we also held a joint meeting with BIAC - Business & Industry Advisory Committee to the OECD. Finally, I joined the OECD Forum, which convened some of the leading voices in the global policy-shaping community, through the prism of three central and interconnected themes: Inclusive Growth, Digitalisation and International Co-operation. [For your interest, note that many of the hyperlinks below include webcasts of the particular event or session]. International co-operation: President Macron's address opened the OECD’s annual Ministerial Council Meeting with a call for countries to work harder to ensure that multilateral co-operation effectively addresses today’s global challenges. His speech was timely, although in some measures its message unheeded; shortly afterwards, the United States announced its unilateral decision to impose significant tariffs on European and Canadian trade. Other sessions on the theme of international co-operation explored new forms of global leadership (New Global Leadership,) and multi-stakeholder “coalitions of the willing” (Firms, Civil Society & Government with Purpose: The Global Deal). Other issues canvassed included those inherently global in nature, such as climate (Safeguarding Our Oceans), and trade (The Faces of Trade). Speaking of trade, the G20 is a vital multilateral platform to address global challenges, including regulation of global value chains, and anti-corruption. Business 20, or B20, is the private sector's voice of the G20 community. It addresses the global challenges and priorities defined by the G20 countries, by building solid consensus amongst business leaders, international organizations and civil society regarding how they should be approached. B20’s trademark is the development of consensus based concrete policy proposals from the private sector with the objective of generating more and better jobs, sustained growth and development. The process involves the constitution of taskforces of around 100 business representatives of the entire G20 and invited countries. After a 7-month period of discussions the B20 is ready to submit its policy recommendations to the G20 leaders - which in 2018 will occur in October in Buenos Aires, Argentina. Digitalisation: the OECD Forum also explored the potential and realisations of companies, start-ups, and individuals (Start-Up Ecosystem), and examined the actions needed to promote quality jobs and well-being in a new world of work (The Future of Work: How?). As policy makers and shapers around the world look to develop the new cognitive and regulatory frameworks to accompany the shift from analogue to digital, the Forum considered the ethical ramifications, (Universal Digital Rights & Digital Inclusion), the implications for the security, society and the economy (Cybersecurity) and the importance of a civic debate on the rise of artificial intelligence. Inclusive Growth: this included panels on seeking tangible ways to address inequalities, through the built environment, (Panel with lunch on Housing), through access to quality education and lifelong learning (Reskilling: How Difficult Is It? ), and navigating employment in a disruptive digital environment (Recruiting in a Digital Age). The Forum ventured down less trodden paths, looking at the implications of loneliness for people’s health and the fabric of our societies (Loneliness), and what robots and humans can learn from each other in the age of ‘singularity’ (Singularity). The Forum also welcomed a host of authors who shared the insights of their work through a series of “Meet the Author” sessions. One of those was Colm Harmon, Professor of Economics and Head of the School of Economics at the University of Sydney, who led a discussion of what it will take for schools to be able to help students think for themselves, develop a sense of right and wrong, and be sensitive to others’ views as part of the World Class: How to Build a 21st-Century School System session. The University of Sydney (my alma mater) is a long time knowledge partner with the OECD, so I was delighted to be invited by Professor Harmon to also join a University of Sydney/Sciences Po Roundtable, held in the Château de la Muette during OECD Week. It was wonderful to see these young university students meeting several Australians working at the OECD, including Australian Ambassador to the OECD, Brian Pontifex.